There is a pervasive (and hopefully lessening) myth that people with locs don't/can't wash their hair. This is completely and entirely false. If anything, I think I started washing my hair MORE since I've had locs (and certainly way more than when I had a perm). Locs should be shampooed regularly, at a minimum every two weeks; though if you work out, have dandruff/dermatitis issues, or live/work in dusty environments you should really shampoo more often. I thoroughly shampoo at least once a week. This keeps dirt from accumulating and permanently becoming part of your locs. For fully mature locs, you should gently squeeze the locs while shampooing and rinsing to make sure the shampoo penetrates the locs as much as possible, and so the shampoo is thoroughly rinsed out. Special care should be taken when washing new locs (see below). It is important to wash locs with a good moisturizing shampoo. Remember, the key to beautiful natural hair is moisture, moisture, moisture! My current favorite shampoo is Carol's Daughter Black Vanilla Herbal Shampoo for dry to very dry hair. I like the Black Vanilla shampoo because it moisturizes very well without the use of a conditioner. Look for shampoos containing natural oils (olive, coconut, safflower, sweet almond, etc.) and/or shea butter. If your locs are fully matured, the use of conditioner is fine every 2-3 washes; it is not necessary to use every time you shampoo. Too much conditioning can lead to build up in locs. If you are new to locking, you need to take special care not to agitate your baby locs too much. For the first few weeks you should clean your scalp with astringent (like Sea Breeze) or witch hazel (which is less drying). Saturate a portion of a clean washcloth and gently rub your scalp along the parts and between each loc. When you do start to use shampoo, you should avoid vigorous scrubbing for a few months. During the first 3 months of locking, I sectioned my baby locs into 4-5 sections and rubber banded the ends together to keep the locs from untwisting. Instead of using the shower head, use a container of water and gently poured that over the hair to wet and rinse the shampoo out. Take special care to just focus on washing the scalp for the first few months and not do too much vigorous washing of the baby locs themselves. You also want to avoid any shampoo that espouses to help with "manageability" or "dangling". Locs NEED to tangle; that's what makes them locs. This seems very obvious, but I almost ruined my first set of locs using Organic Root Stimulator Uplifting Shampoo (an otherwise great shampoo) because I didn't think about the word "manageability", I just was focused on clarifying (see below). For someone with baby/teenage locs (I'd say up to one year) conditioner is not your friend. Conditioner will cause locs that are not fully matured to unravel. It is important to avoid build up in your locs as much as possible. The best way to avoid buildup is to prevent build up. Shampoos, conditioners, styling products, dirt and lint can all accumulate and contribute to build up, making your locs dull and stiff. The best way to avoid build up is to avoid using too many products in the first place. However, every few weeks you should use a clarifying shampoo to remove any products that have built up in your locs. You don't want to use clarifying shampoo every time you shampoo, as they can be somewhat harsh and drying. You can use a clarifying shampoo such as Neutrogena or Panteen, or seek out a shampoo with more natural ingredients such as Avalon Organics Lemon Clarifying Shampoo. Another way to clarify your locs is with the use of an apple cider vinegar rinse. There are many recipes for ACV rinses out there. Personally I simmer 1-2 sprigs of fresh rosemary in 2 cups of water for 15 minutes, then add 1/4 cup of apple cider vinegar, about 1/2 tablespoon of olive oil, 3-5 drops of tea tree oil, and 2-3 drops of either peppermint or lavender essential oil (depending on my mood). You can use this rinse either before shampooing by saturating your hair and scalp and allowing to sit for 15-20 minutes, or use it as a final rinse after you shampoo. The apple cider vinegar smell will dissipate as your hair dries. ACV is great for removing build up and helps treat itchy, flaky scalp by balancing the pH of the scalp. Rosemary is good for people with dark hair (i.e. most of us) to help bring out the natural highlights, and also helps treat thinning hair. For additional clarifying, you can add the juice of 1/2 lemon to the rinse. Lemon juice also helps break down oil and product build up. Sodium lauryl/laurth sulfate. This a very common detergent found in shampoos that causes soaps and shampoos to create lots of foam, but is also a skin irritant. It dries out skin and hair because it is an effective degreaser; however our skin and hair needs some level of oil to be healthy. We have been conditioned to believe that more foam means better cleaning, but this is not necessarily the case. 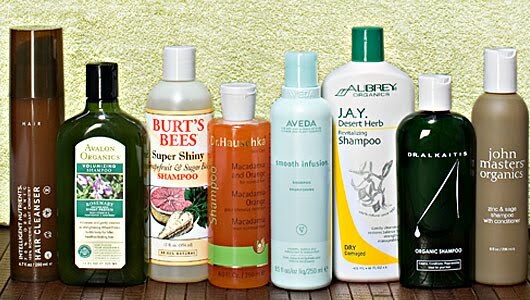 Natural products will have less foam than shampoos containing this chemical, but work just as well. Propylene Glycol. This is another common ingredient in shampoos and conditioners. It is a humectant, which are supposed to retain moisture in hair and skin by attracting water, however, they can also leave a suffocating film on skin and hair. Propylene glycol is also used in industrial products, and can cause skin irritation. Silicone Oils (eg. Dimethicone, Cyclomethicone, Copolyol). These chemicals are classified as emollients, which are supposed to prevent dryness. They are often included in hair care products to produce shine for the "appearance" of healthy hair. However, these chemicals create a coating on the hair that blocks the absorption of substances that are actually moisturizing and nourishing to the hair and scalp. You can find a more extensive list of common harmful chemicals in cosmetic products here. Thank you for sharing this information. I have had clients come to me with so much product build-up from not shampooing. Their previous loctitians would tell them not to shampoo for a month. One was told that the 'dirt' would help his lock mature. Oh wow, that is awful! Mature locs and caked dirt are NOT the same thing! I can always tell when someone is lax with the shampooing (particularly guys) because their locs have a constant "musty" smell. Locs are still hair, and hair should be washed! Thanks for the info. I'm thinking of doing my own maintainence and I'm looking for a good clarifying shampoo. I think I'll try your mix then a good moisterizing shampoo (what would you suggest?). Now do you retwist after every wash? I ask because I've heard that you don't want to over twist your locs, and I don't want them getting really tight and skinny. @Kalvina: Lately I've been using JASON Aloe Vera shampoo that I've been quite pleased with. I usually do retwist after every wash (with some exception; last time I didn't); however, I do my own maintenance so I don't twist them very tightly like a professional would. I don't like the flat look that results from twisting them too tightly either. I think it's a matter of preference, just don't go TOO long between retwisting so your locs don't creep together (ask my kids about that). Excellent post. I'm one of those that was (wrongly I believe)advised to wash every 4 weeks. One "professional" even insisted that 4 weeks was too much, should do it every 6 weeks. I have some build up and have tried Jamaican Mango&Lime Tingle Shampoo several times but I can still see the build up and bits of what look like dandruff after 4 applications of shampoo/rinsing followed by apple cider rinse (full strength). Any advise. Also what products would you recommend for re-twisting hair such that it doesn't unravel in two days but also doesn't cause build up. @Anon: You should try a different shampoo. I would highly suggest using a clarifying shampoo to remove the buildup. Also, you can do an ACV pre-shampoo treatment, adding lemon juice to your AVC rinse. Lemon juice is also a natural clarifier. Let the rinse sit on your hair for awhile before shampooing. Just be careful not to use too much lemon juice, especially in conjunction with the clarifying shampoo, because you'll strip TOO much out of your hair. I've read the ingredients of Jamacian Mango & Lime and wasn't too impressed (not so sure all those chemicals were in the "traditional Jamacian formula"), though I know many people with swear by it. Though many people also swear by not washing either. For retwisting, I love Organic Root Stumilator Loc & Twist Gel. It's a light gel that doesn't flake or make your locs stiff, and I've never had a problem with build up (once I started using it sparingly). A little goes a long way, and a jar lasts me at least 6 months (and that's doing 2-3 heads of locs). i came across the page reading up on locs. I started mine 3 weeks ago. i think i'm washing my hair too much because now my roots are loose and i have to 2 strand twist that are coming loose. I have very soft and thin hair so washing makes it loose again. i have thought about not washing again 4 another 3 wks. i had been washing every 3 days, because i read if you are freeforming you should wash more often.